A certain someone turned seven the other day. Seven seems so big to me, and this milestone hits me on so many levels that it's a good thing we took the week off (S's birthday always fall on a school vacation week) because it gave me a little time to contemplate all the implications, including the fact that I started this blog six and a half years ago, and this blog was the start of my company, which is truly a family business. I never could have imagined we would be where we are now when we decided to have a child. Or to start a little company. Or the fact that S fits into this dress my mom made me back in first grade. My sisters all wore it, too. It's in really good shape considering that it's already been worn by at least five girls. Anyway, this photo is mostly for my Mom. To thank her for all that sewing she did for me. And for handling all my special sewing requests. She sewed everything: school dresses, church dresses, prom dresses, blue jeans, quilts, doll clothes, and knock-offs of the Esprit dresses I wanted so desperately and couldn't afford. The list is really endless. She is an excellent sewist and a gentle, generous, and loving mom. And she also knew when to say no to my sewing requests. Like the day before high school graduation, when I decided I needed a new outfit and came home from the store, fabric and pattern in hand. Saying no helped me to appreciate all the time and effort that goes into sewing. And it gave me the little push I needed to start sewing, myself. All the dresses my mom made and saved are so precious to me. I just boxed up a whole bunch of them and shipped them back to her because I don't have space for them. But I photographed them, and I know they'll be waiting for my sisters when they have kids(?). Plus, I added a bunch of my own sewing to the box. Nothing like adding to the tradition, right? Thanks, Mom. And happy birthday, S! seven does seem big- my 2nd grader turned 7 in december, and just today i said to her that she seems so different, looks so different. She's not a baby anymore, barely a little girl. She's becoming more independant and its amazing, but so hard to let go. Happy Birthday S,we hope you had a lovely day! What a great post, Liesl. I especially love the part about your mom saying no - I'm pretty sure I took advantage of my mom's sewing talents without knowing it, and now that I sew I know how much work goes into it and I definitely appreciate handmade a lot more! And thank you for starting Oliver + S, I'm so glad you did because I've learned so much from you and my kids have gotten to wear handmades from me because of you! And also, happy birthday to S! She is such a cutie! I have a number of dresses my mother made that all of us wore and I too have added to the collection. I came home the day before my high school gradution with a new dress in mind as well - with the intent to make a matching one for my best friend. I got them both made, although I ended up sewing myself into mine, as I didn't have enough time to put a zipper in. I never did go back and fix that either. Your daughter is so sweet and cute. I have been following your blog for a long time, I cannot believe she is 7- what a sweetheart! My little guy is turing seven is a couple weeks - yes it is a milestone! I've been really emotional lately because of it! Happy B-day S! My mom taught me to sew when I was seven - and it is still my passion today! 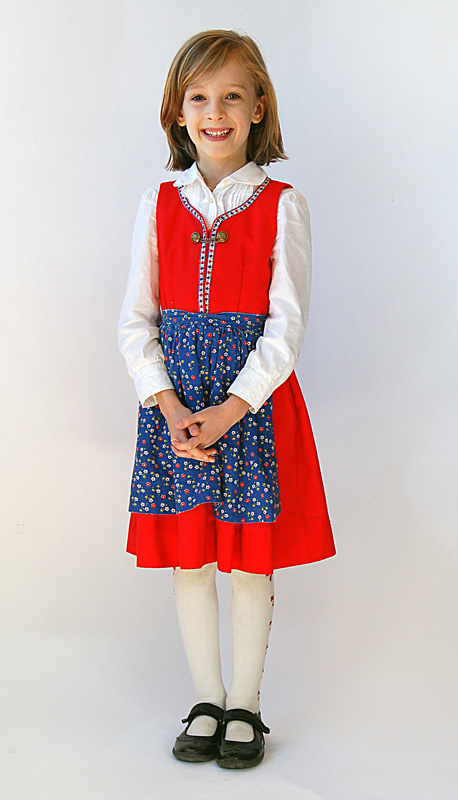 I also have a few outfits that my mom made, but also have a few that my Grandma made, that I really cherish. I have a "mother-daughter" skirt set in wool plaid. Looking at the size, and old family pics, I was about 7-8 years old. My son is learning how to sew, and he really likes it. I think it has more to do with using a machine than the act of making something, but he is proud when he gets his project done! Thanks for sharing, and I do love your patterns, I've got a couple of them, and love the style! When I was in third grade, your sister A. loaned me a plaid drop-waist dress for a very important choral concert. We were told that special guests were coming to sing "We are the World" with our chorus. We were certain that Huey Lewis was going to show up. The dress ended up being the highlight of the evening as a local gospel choir didn't quite match our expectations. Thanks for reminding me of this special memory, one closely connected to your mother's talented hands. Seven! My own little girl is seven, so I know for a FACT that only 2 or 3 years TOPS have gone by in the last 7 years. I feel your pain, Leisl. Happy belated birthday, S. Squeeze your mama extra this year. Happy birthday!Wish you have a wonderful day! Odd question, but is your family Norwegian? The dress makes me think of Scandanavian folk wear.